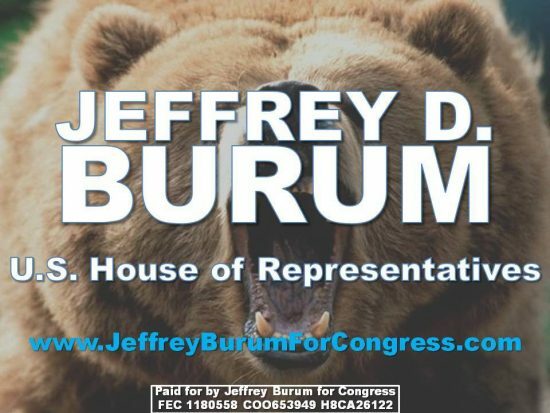 We endorse Jeffrey Burum for Congress in CA Dist 26, which is most of Ventura County and some of LA County. He is hands-down the most qualified, most Constitutional candidate. He has strong financial, investing, accounting and tax knowledge, having been a CPA, done budgets for most of the Desert Storm deployments and run a tax, accounting and financial planning CPA practice for 20 years. He also taught nuclear strategy at the War College and understands quite a bit about international military and political strategy. Burum is a retired Air Force Major, a Gulf War and Cold War veteran. He was disabled during his middle eastern deployments but has overcome/learned to deal with much of that to function well. A bonus is that he is scandal-free! Incumbent Julia Brown is one of the 4-5 most Liberal members of the House of representatives. She votes the Pelosi-Schumer hard-left agenda, which does not really seem representative of this district. As for Brown’s Democrat opponent: he thinks she’s not Liberal enough? Burum’s Republican opponent lacks the education (G.E.D. ), experience, knowledge and moral compass to be our representative in Congress. Mr. Burum is strongly pro-Second Amendment- the ONLY CD 26 candidate not advocating more gun control.